John received his elementary and secondary education in Madison. He studied Electrical Engineering at the University of Wisconsin, receiving a B.S. in 1928 and an M.S. in 1929. The three years 1930-33 were spent doing research in geophysics at the Gulf Research Laboratories in Pittsburgh, Pennsylvania. In 1933, he returned to graduate studies in mathematical physics at Princeton University, where he had his first introduction to solid state theory from Professor E.P. Wigner, and received his Ph.D. in 1936. The three years, 1935-38, were spent as a Junior Fellow of the Society of Fellows of Harvard University, where he worked with Professors J.H. Van Vleck and P.W. Bridgeman. From 1938-41, he was an Assistant Professor at the University of Minnesota and from 1941-45, at the Naval Ordnance Laboratory in Washington, D.C. In the fall of 1945, he joined the newly formed research group in solid state physics at the Bell Telephone Laboratories, Murray Hill, New Jersey. It was there that he became interested in semiconductors and with W.H. Brattain discovered the transistor effect in late 1947. He left Bell Labs in 1951 to become Professor of Electrical Engineering and of Physics at the University of Illinois, Urbana, where he was Professor and Emeritus Professor. At Illinois, Bardeen established two major research programs, one in the Electrical Engineering Department dealing with both experimental and theoretical aspects of semiconductors, and one in the Physics Department which dealt with theoretical aspects of macroscopic quantum systems, particularly superconductivity and quantum liquids. The microscopic theory of superconductivity, developed in collaboration with L.N. Cooper and J.R. Schrieffer in 1956 and 1957, has had profound implications for nearly every field of physics from elementary particle to nuclear and the helium liquids to neutron stars. During his sixty year scientific career, he made significant contributions to almost every aspect of condensed matter physics from his early work on the electronic behavior of metals, the surface properties of semiconductors and the theory of diffusion of atoms in crystals to his most recent work on quasi-one-dimensional metals. In his eighty-third year, he continued to publish original scientific papers. Bardeen, a Fellow of the American Physical Society, served on the Council from 1954-57 and was President in 1968-69. He was elected to the National Academy of Sciences in 1954 and the National Academy of Engineering in 1972. He served on the U.S. President's Science Advisory Committee from 1959 to 1962 and on the White House Science Council in 1981-82. He was a founding member of the Commission on Very Low Temperatures of the International Union of Pure and Applied Physics from 1963-1972, serving as chairman in 1969-1972. From 1961-1974 he was a member of the Board of Directors of Xerox Corporation and was a member of the Board of Supertex, Inc. from 1983 to 1991. Honors have included the Stuart Ballantine Medal, Franklin Institute (1952), Buckley Prize, American Physical Society (1954), John Scott Medal, City of Philadelphia (1955), Fritz London Award for low temperature physics (1962), the Vincent Bendix Award of the American Society for Engineering Education (1964), the U.S. National Medal of Science for 1965, and the Medal of Honor of the Institute of Electrical and Electronic Engineers (1971) and the James Madison Medal of Princeton University (1973). He shared the 1956 Nobel Prize for Physics with W.H. 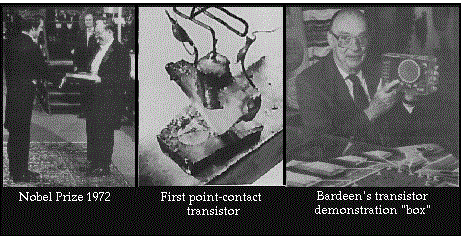 Brattain and W. Shockley for research leading to the invention of the transistor and the 1972 Nobel Prize with L.N. Cooper and J.R. Schrieffer for the theory of superconductivity. He received the distinguished Lomonosov Award of the Soviet Academy of Sciences in 1987. In 1990, Bardeen was one of 11 recipients of the Third Century Award honoring exceptional contributions to American creativity. He was also named by Life Magazine as one of the 100 most influential people of the century. Other achievements include medals from the University of Wisconsin varsity swim team and a hole-in-one in a golf tournament held at the Champaign Country Club. Bardeen married Jane Maxwell in 1938. They had three children: James M. Bardeen, William A. Bardeen, and Elizabeth A. Bardeen Greytak. Their grandchildren are Charles G. Bardeen, Karen G. Bardeen, William T. Bardeen, David P. Bardeen, Andrew B. Greytak, and Matthew B. Greytak. These streaming video presentations are seminars by Professor Nick Holonyak Jr., former student of John Bardeen, currently the John Bardeen Endowed Chair in Electrical and Computer Engineering and Physics, and Center for Advanced Study Professor, University of Illinois.